Yet another rogue is locked up. Yahapalanaya please make sure these animals are not let out to roam free after 15 days of FORCED HIBERNATION. It would be better for the former ROYAL FAMILY to confess to all their crimes and cough up all that they stole back to the Treasury. At least Yahapalanaya crowd might show a BIT (not a lot) of mercy. Also, the state coffers would have the much needed cash reserves. If they still feel they can win over the people and be arrogant, it is best that their POLITICAL prospects are ruined and ensure that they never even think about politics every again. LOCK THEM UP AND THROW THE KEYS IN THE INDIAN OCEAN. Whoever whatever being spread – please right thinking – educated lankens, let s get together to prove all the allegations levelled against the most abusive president of the nation -Mahinda Jarapakshe. Alone this men like Sajin Vaas – henchmaen without any provable qualifications for the jobs to have been appointed as Monitoring Ministers – keeping them above the law is a great blunder that a President could make. But even today, MR dares to open up and ask what he has gone wrong. It is almost like he feels that People of the country are all fools. If a TEAM would go wrong- the panel leader should take the full responsiblitiy- since almost everything will work on the decisions made by him. So the people ‘s president if he made dedicions thinking only aobut his sake – to the manner Rajapakshes did it – there, he cant go on saying that he is not responsible for that. Let alone today Rajapakshe should be made clear by LAW AND ORDER BODIES that his administraton was not at all law bound one. I wonder even today, so called BIG VOICES among the senior journalists of the country – taking for example Victor IWAN to stay AS IF KIRIMATI GILAPU kimbula today- while all went wrong in the post war sessions of the country- I miss LASANTH Wickramatunga in this regard. He was not backward to go against any high guys.. for that he sacrificed his life for all of us. There is no other way, Rajapakshe should be brought before the cought is the WISH of all those respect JUSTICE of the country. Arrest Bandula Jayasekara too, these men worked together wasting state money in Sydney. Sajin visited Sydney with his men and Bandula entertained them day in day out with our money. Take a close look at this idiot Bandula’s anonymous twitter account abusing the current government. Disgraceful. Always shady man. In srilanka, there are guys that tend to corrupted world of issues rather than any good issues. See, people criticise Ranil but would do so towards Mahinda why ? Even if their lovely ones would have repeatedly been assulated, whitevanned, tortured by Rajapakshe Henchmen, nothing seen have happened inthe past when Rajapakshes ruled the nation as if a buffaloe plougher did it in paddy lands. People had no choice as it is the case for today- they just listened to Media men appointed by Rajano. Where has the Jackson Anthony gone today ? Where has the other bunch gone to this day ? All these men have something common with that pennisless Vasudewa WHO would do anything to go against any anti Mahinda groups. I really dont know why the senior Men of the montherland behave so. What about his uncle Major general Prasad Samarasinghe who was working at Telecom tower project funded by the Chinese. It was wrong for a senior Army Officer to do two jobs. Anusha Palpita and Sain’s good friend Lalith Weeratunga are also involved in this. 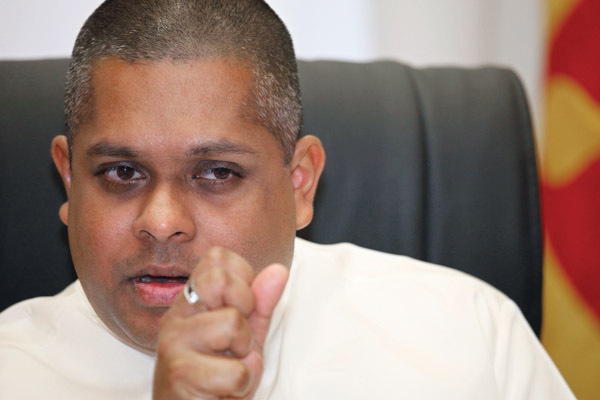 It is an open secret that Prasad samarasinghe and Ausha Palpita operated an election office in support of MR on the date of the Presidential election. Thanks to Yahapalanaya he is still the Army Chief of Staff. These conspirators should be brought to book asap otherwise they will launch a coup to eliminate the President.